The 2018 Honda Accord is a car of contradictions, starting with its premise. This is an all-new, thoroughly re-engineered and freshly designed car intended to usher in a 10th generation of Honda’s popular family sedan. But it’s trying to do so without straying too far from the formula that made it popular in the first place: high quality, good fuel economy, smart cabin packaging and an engaging feel from the driver’s seat. Honda managed to check all those expected boxes on the 2018 Accord while adding something surprising, too. It’s adventurously good looking now, shucking off the visual conservatism that’s long been a part of its history. It also is a contradiction in the marketplace. While most car manufacturers are pouring their best innovative energy into ungainly but immensely popular SUVs and crossovers — leaving their sedans to languish and get stale in comparison — this new Accord feels like no expense was spared in making it more appealing. It doesn’t take much time to see and feel the difference. This is the first Accord to use structural adhesives and acoustic spray foam to make it quieter. An unusually large portion of its body — 29 percent — is made from ultra-high-strength steel, something that makes it more rigid and 42 pounds lighter at the same time. 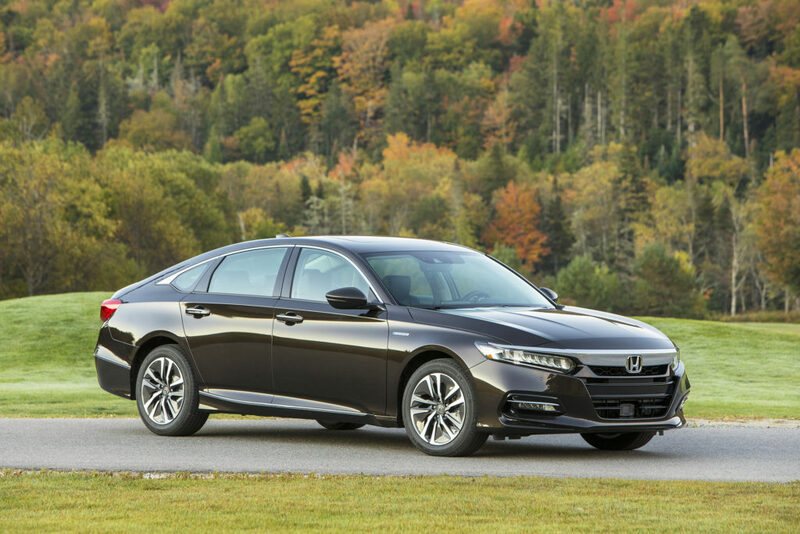 The all-new 2018 Honda Accord breaks from this car’s long tradition of conservative designs. Its roofline is sleeker and lower, and its wheels are pushed to the corners like the best sports sedans. Its suspension has been heavily revised and carefully tuned to make it feel connected to the pavement and nimble in corners, just like an Accord should. The changes add up to a driving experience that makes the new Accord feel more like a premium car than ever before. It’s poised, refined and rock-solid over the road. Its new look reinforces that premium perception. A significantly longer wheelbase, along with slightly lower height and wider stance, makes its overall shape look more athletic. A sleek roofline, elongated headlights, horizontal grille and gaping air intake complete the “contemporary luxury sedan” appearance checklist. No flavor of the new Accord shows off its innovations better than the one I tested, a high-trim Touring version with the hybrid powertrain. It feels quick, sophisticated, spacious and immensely comfortable, all while achieving EPA fuel economy ratings of 47 mpg in both city and highway driving. Other versions of the Accord give you a choice of 1.5-liter or 2.0-liter turbocharged engines. You can no longer get it with a V6, a decision that breaks my lead-footed heart. I’m slightly soothed by the fact that the bigger turbo engine, based largely around the powerplant in the mind-blowing Civic Type R, makes even more torque than the V6 did. Honda even managed to eliminate my consistent brand gripe — the sound system controls — by putting physical volume and tuning knobs back onto the radio. Hallelujah! The Accord’s cabin is roomier and more upscale than before, with quality materials, tight construction and an easy-to-use layout for technology and controls. The only thing that I found noticeably worse in the new design is rear visibility. The sleeker roofline and sportier rear styling make for smaller, skinnier windows, something that hurts when backing out of tight parking spots. Fortunately, Honda addressed this drawback by making parking sensors, rear cross-traffic alert and a multi-angle rear camera all standard equipment, even on the base model. They’re part of the no-extra-charge Honda Sensing package that includes lane departure warning, adaptive cruise control and traffic sign recognition, something I found most useful for checking the speed limit when I hadn’t noticed a sign recently. The smart car would notice, even if the dumb driver didn’t. Pricing for the Accord Hybrid starts at $25,100 for the base model and ranges up to $34,710 for the luxury-oriented Touring trim. The base, non-hybrid Accord starts at $23,570. It’s an all-new, re-engineered version of one of the world’s most popular mid-size cars. It looks and feels like a more premium product without sacrificing the things that make it a perennial bestseller.